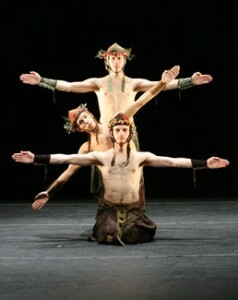 This is Sydney Skybetter, Philip Montana, and Bryan Campbell performing in “The Voyage of the Húi Corra” (2008). Photo by Tony Dougherty. The tale of the Uí Corra may start out as an intriguing fairy tale, but their journey is not for the faint of heart. Their quest for knowledge soon deepens into a dark and stormy voyage of tortured souls and infernal visions. Join the Story Archaeologists as they plumb the contradictory depths of this under-appreciated Immrám. Check our Reading List for further reading and resources. ← Welcome to our new site!